You have selected the MLB Full Season Premium Pass (Includes DFS Premium and Playoffs) - 50% OFF membership level. 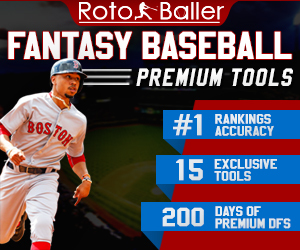 RotoBaller's MLB Premium Tools and resources for both season-long and daily league (DFS) formats. 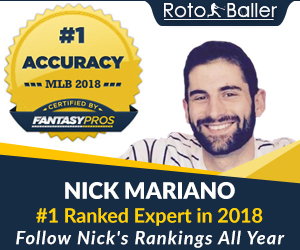 Includes various preseason tools (Draft Kit, premium rankings, sleepers, etc. ), various in-season tools (Matchup Ratings, streamers, waiver wire, etc.) and the entire season of DFS tools (Lineup Picks, cheat sheets, expert lineups, etc.) - published seven days a week. Playoff coverage is included through the World Series. This subscription auto-renews yearly. You can cancel auto-renewal anytime in the My Account section. If you prefer to subscribe just for this MLB season, you can click here. Lineup Optimizer/Generator is not included in this option, that is priced separately. See other options here that include the Lineup Optimizer.